Tamy passed on two lovely awards to me recently and I am finally getting around to showing them off and passing them on! 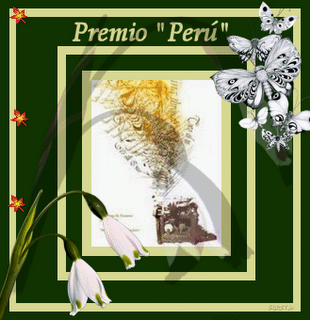 The first is the Premio "Peru" Award. I thought I'd start by awarding this one to a few of my international blogs that I subscribe to for the inspiration, photos and simple beauty. Even though I can't understand a single word in the writing. And then 3 others that are always inspiring and finding ways to share their creativity. You must choose 5 blogs you think are deserving of this award for their creativity, design, materials and interesting contribution to the blog community regardless of their language. Each winner should display the prize and put the name of the blog link and the person who has rewarded her in the post. The second is the Perfect Blend Of Friendship Award! Very nice Barbara - Thank You !! Fantastic post - I love the part about being inspired by their blogs even though you can't read them - what a compliment to them. 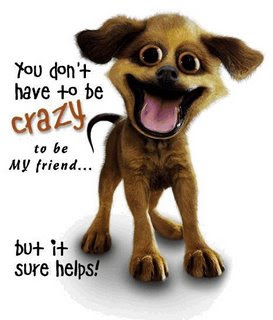 Thank you also for the great new award, but it isn't hard being your friend. With all we have in common I feel like we have known each other forever! Thanks Tamy! And you're welcome! Hi there! I just found your cute blog! :) I am glad I did!! You seem to have wonderful things happening here! Thank you! I just peeked at your blog, love the paintings! I look forward to perusing them. I'm very honored to be included here. Thank you Barbara, you are a sweetie. I appreciate it very much and I want to congratulate YOU for receiving it in the first place! Thanks Melissa! And you're welcome! awww I didnt see this in my little internet time on hols. Thats lovely thankyou.Just need to work out how to show it on my right hand column now! You're welcome. Glad you are back.